October is National Domestic Violence Awareness month in the U.S. Some statistics show there have been 4,000 deaths of women in the past 12 months in the U.S. alone. In a country where one in four women and one in seven men experience domestic abuse in their lifetime, there remains much work to be done. In support of Domestic Violence Awareness month, Transcendent Media Capital are launching its web and podcast series “Voices” this October. 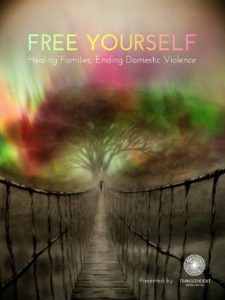 “Voices” is part of the Free Yourself Global campaign, the first fully interactive global domestic violence initiative. “Healing Families; Ending Domestic Violence”. We are collecting stories from around the world from survivors, recovered abusers, researchers, NGO’s, policy makers, law enforcers, health professionals… anyone who has been touched by the issue of domestic violence. You can load your story in either video, audio only, written or artwork at www.freeyourselfglobal.com where there is a story uploader and you can submit your story. This may be selected to be aired on our “Voices” series. We want to hear about your experiences, what you did to recover from abuse and what do you think is required to interrupt the pattern of abuse in families?